On 21 September 1599 a Swiss tourist, Thomas Platter, visiting London, went to the newly-opened Globe Theatre to see a play. As it happened, he saw Shakespeare’s Julius Caesar. The occasion made quite an impression on him, so much so that he wrote a long description. This is a translation. Thus daily at two in the afternoon, London has sometimes three plays running in different places, competing with each other, and those which play best obtain most spectators. This is one of only a handful of accounts of what it was like to attend the theatre. 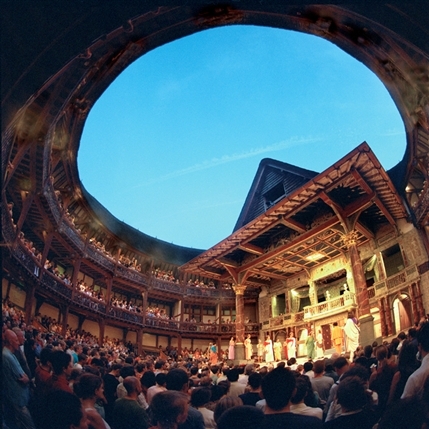 From it theatre historians have drawn many conclusions about playhouses in Elizabethan England, and about the experience of the audience. It’s something of a miracle that this information has survived, but it began with Thomas Platter taking the trouble to write down his memories of the experience. I’m interested in recording members of the audience to build up an archive about the modern experience of seeing Shakespeare in the theatre. This project is only in the planning stages at the moment, and you can find more information the RSC’s MyShakespeare blog, and on the Listening to the Audience page. If you’d like to be kept up to date with news about the project, just leave a comment on the Listening to the Audience page. This entry was posted in Legacy and tagged Globe Theatre, Julius Caesar, Listening to the Audience, memory, My Shakespeare, Royal Shakespeare Company, Thomas Platter. Bookmark the permalink.